Make these sweet crocheted hugs and kisses basket as a perfect gift for your friends and family this Valentines Day! In fact, celebrate the love month by sharing hearts with anyone close to your heart. You can also fill them up with small thoughts inside such as sweet candies or crocheted mini hearts. These sweet little baskets are made by building onto the hearts crochet pattern. Once completed, these lovely baskets should each measure approximately 4.5 inches. If you prefer metric measurements, the finished crocheted hugs and kissed baskets are each about 11.5 cm. 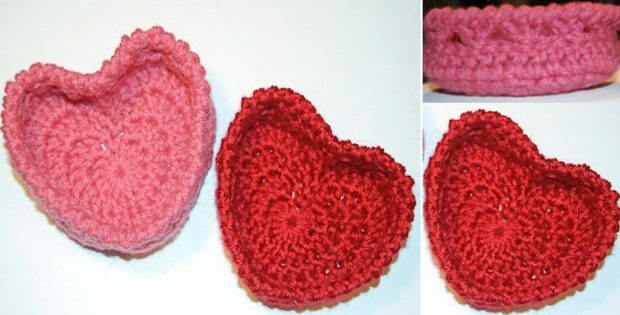 The designer of the pattern for the charming crocheted heart shaped baskets made it an easy crochet project to follow. Thus, even beginner crocheters can make these crochet hearts. Kara Gunza from Petals to Picots created the design for these charming crocheted baskets. Access the FREE pattern for the cute and simple crocheted heart shaped baskets at Petals to Picots. Featured images(s): Petals to Picots – thank you!